What the countless travel blogs on the web fail to highlight are the unexpected illnesses, injuries, or trip interruptions you need to know how to protect yourself against before traveling. The unexpected awaits you in any destination and in Southeast Asia, the unexpected takes on different forms in every one of its countries. Southeast Asia has been amongst the fastest growing destinations in the world since 2012. In recent years, Singapore ranks as the wealthiest and least corrupt country, while maintaining a Parliamentary Republic. Malaysia exceeds expectations of growth as a ‘newly industrialized’ country under the rule of a Federal Constitutional Monarchy. Thailand grows while overcoming its well-known unpredictable political conflicts and volatile natural disasters. Indonesia is as prosperous as ever with a new political transition to Democracy and an economic challenge of poverty amongst its dense population. Tools to assist you in precarious circumstances, no matter your mode of transportation in Southeast Asia will help protect you from the unexpected. A key tip: all Southeast Asian countries consider a valid passport as one that extends six months beyond the dates of your trip. It is also a good idea to have the contact information and address of the nearest Embassy of your home country available. Your supplies are only as good as your storage method. More than likely you will be carrying all of your belongings in one backpack, so you can’t afford to mistreat, lose, or ruin your supply cache. A backpack designed specifically for travel, versus hiking or camping, is highly recommended because it is accessible from the side, versus a hiking pack that has a drawstring top and an extra flap to open. Choosing the right pack for traveling can help you avoid unexpected trip interruptions and injuries. Proper storage of all supplies includes storing them in a single, water-resistant, insulated, and padded bag clearly labeled. Having these items in a designated place on your person and easily accessible is the key to preparedness when the unexpected strikes. A preventative measure against unexpected illnesses and injuries includes the type of clothing you wear. Synthetic fabrics are the easiest to travel with for their light weight, flexible, durable wrinkle-resistant qualities, while being easy to hand wash and quick to dry. A synthetic fiber will be efficient to clean off any bacteria or viruses picked up from bus or motorcycle seats, markets or restaurants that your body does not have immunity for like the locals do. Read more about travel clothing here, and be sure to see the last paragraph for the bullet list of recommended sources. 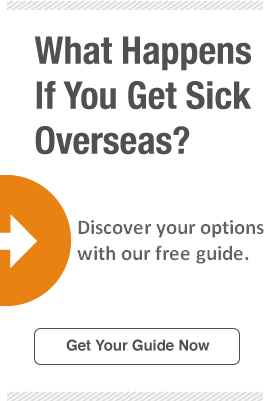 No matter where you travel in Southeast Asia the threat of an unexpected illness, injury, or another type of trip interruption is always a possibility. When traveling to the more popular tourist countries like Singapore, Malaysia, Thailand, or Indonesia, the types of unexpected dangers are specific to the individual areas, as well as, a risk in any of the four. Some of the common risk factors in Southeast Asian countries are illnesses like Malaria, Rabies, or Dengue Fever; injuries like bus or motorcycle accidents; and monkey attacks. You could experience trip interruptions as the victim of petty crimes like stolen credit card information; scam, natural disasters- like tsunamis, earthquakes, monsoons, and volcanoes; or a terrorist attack, specific to the larger cities. Fortunately, there are ways to prepare yourself for the unexpected illness, injury or trip interruption. The CDC has in-depth information about the health and safety of travelers. Consulting a travel doctor before leaving for your trip is vital, even if you are fit, active, young, or healthy. An expert can advise on the potential unexpected dangers you will encounter while abroad, and recommend a course of action in protecting yourself from geographic specific illnesses, i.e. food poison, typhoid, malaria or hepatitis A and B. Not every prescribed preventative medication listed in this blog is right for everyone. Your travel doctor will be able to individualize your regiment the best for you and what you are the most susceptible to based on your medical history. Learn more about immunization in this blog post. Travel medical insurance coverage for the duration of your trip minimizes the effects of unexpected events, and it is likely your current health insurance provider will not cover you outside of your home country. With a travel medical insurance plan you will benefit from the relationships your travel insurance provider has established with the doctors and hospitals in Southeast Asia. A medical insurance provider will also cover most travel-related illnesses or injuries and may fly you out of the country to receive the appropriate health care. It is the company’s job to think of these unexpected occurrences for you so there are procedures in place if events such as kidnappings or the need to be evacuated occur while abroad. Crisis Response benefit for kidnapping and ransom: Why? A travel medical coverage plan is a reliable option to prepare against the unexpected illness, injury, or trip interruptions. Get a free quote here.